A King Post Support System was used in conjunction with hydraulic jacks and skid shoes to propel the bridge across the River without any in-stream temporary supports. Although the bridge is 80 meters in length, the critical part of the launch was the first 60 meters when the bridge was cantilevered over the river, until the south end of the bridge touched down on the pier. It is anticipated that the first 60 meters of travel will be completed in one day. (April 11th) The remaining 20 meters of travel requires a series of detailed and coordinated steps and is anticipated to take two to three days to complete. This is the first arch bridge in the world (that the Design-Build Team is aware of) that has been launched with a king post support system. 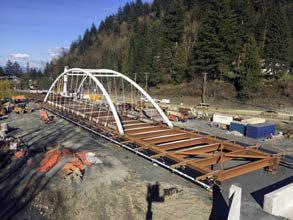 The bridge was fabricated in Delta, BC, at Supreme Steel’s Canron facility. The launch cable is a spiral strand cable with a minimum breaking strength of 4,070 kN (415 tonne –force, 915 kip). The precast concrete counterweight panels, will form part of the bridge deck after the bridge is in place. The bridge system has been designed to minimize the amount of work needed to be completed over water. Completing work over land is far safer, more productive and cost effective. 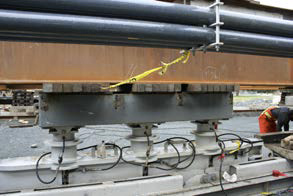 The suspended utilities (sanitary, water, gas, BC Hydro, and Telus) have all been preinstalled under the bridge. Posted on February 15, 2018 by Jessica Christensen This entry was posted in Featured Projects, Industrial Equipment Projects. Bookmark the permalink.